If you’re looking for a highly professional, reliable and popular children’s entertainer in Garston, then look no further! Zippy Junior’s parties are always tailor made to your function and also to the age group. Zippy loves to party with children from 1-9 and his combination of magic, balloon and disco are always a real hit. Zippy Junior can also provide karaoke, circus workshops, children’s quiz shows and a large video screen playing all of the latest chart hits, and action songs such as ‘The Cha Cha Slide’. 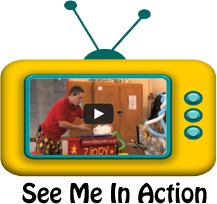 Zippy Junior has many different shows, and each show is fun for all of the family. Zippy always bring along a very special guest, being one of his 6 live magical rabbits! Zippy Junior also does magic with live doves on some of his large stage productions.